Guys’ clothing is notorious for being comfy while girls have to wear pants that are tight and shirts that are itchy. Every now and then, girls should be able to experience the comfort guys get to experience every day, but how can they do this without actually looking like one of the guys? Whether you reach into your guy’s closet or shop in the men’s section, there are sure to be some worthy pieces. Here are some tips on how to wear guys’ clothing while still spicing it up to make it more feminine and chic. Every girl should have her go-to oversized flannel for those cold winter nights and the days she sleeps in a little too late. You can dress this up by throwing on a v-neck sweater and rolling up the sleeves. Pair this up with jeans and your best jewelry and you’ll be ready for the day, while being both comfortable and presentable at the same time. For those days you just don’t want to wear something tight and restricting and instead feel relaxed, pull out that oversized t-shirt, a pair of leggings and slip your feet into some heeled boots. Add a matching sweater for the final touch and you’re ready to start your day while still feeling cozy. Who says girls can’t wear bowties? If you want to wear an average outfit, but want to add a statement piece, grab a bowtie and pin it onto your shirt. This is a bold accessory that any girl can pull off and something that will give your plain outfit a unique and interesting look. If you have a blazer that’s a little too loose, throw it on over a jean jacket and roll up the sleeves. It will make the blazer feel more snug, but will still feel comfortable enough to wear around. 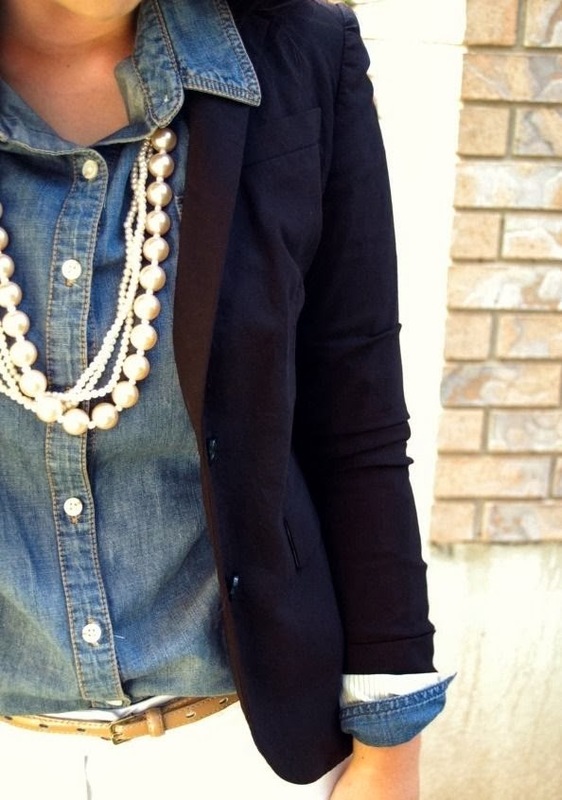 Add a statement necklace and some bracelets to make the outfit more elegant and girly.